THE DUAL TRAK™ LADDER is designed to provide safe, convenient access to tall shelving on both sides of narrow aisles in storage areas. A 33% increase in vertical storage space is typically achieved. The key to the Dual Track™ ladder is the overhead carriage on which the ladder is mounted. this heavy-duty carriage is mounted on dual tracks attached to shelving on both sides of the aisle. The carriage and ladder assembly rolls smoothly on these tracks along the length of the storeroom aisle. Swivel casters on the bottom of the ladder assist in this easy movement and the ladder sets firmly on upper pad legs while in use. Additionally, the brake ladder rolls from side to side across the aisle on a track mounted on the carriage. This permits easy access to stock on each side and walk-by clearance. A handrail extends above the ladder for use while standing on the upper steps. Calculate the distance from the floor to the desired track mounting surface which should be no more than 4 feet below the top of the highest merchandise to be reached. Aisle widths must be identified before ordering correct ladder. 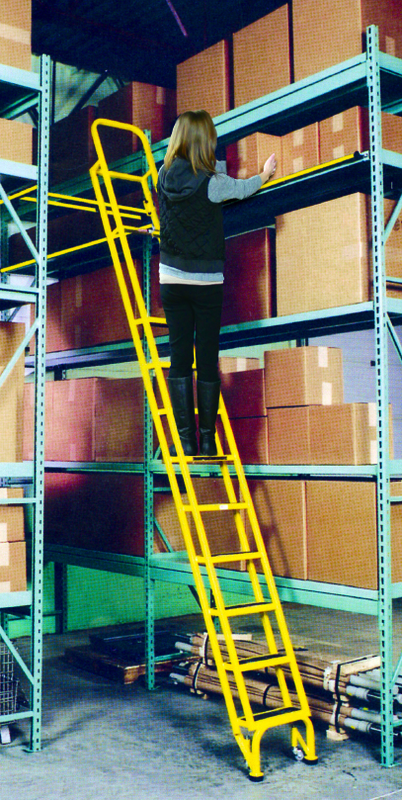 Dual Track™ ladders can be used in aisles from 35″ to 61″ wide. THE SINGLE TRAK™, mounted shelf ladder is designed to provide easy access to shelves in narrow aisles and cramped storage areas. These ladders have a smooth rolling upper track fixture mounted on straight track at the front shelf edge. 5″ wheels with weight actuated brakes allow easy movement of the ladder along the entire length of the track. The rugged all welded steel construction features 5″ deep by 14″ wide solid steps with abrasive treads. Fine wood construction is also available. From the chart below select the proper model based onto WORKING HEIGHT required for your application. Based on the model selected, specify the required track height from the floor to the top of the track ( in 1″ increments). Stay within ranges shown. Please contact Cotterman® Customer Service for complete details of Track and Mounting Options for the Single and Dual Trak Ladder Systems.